Gregg McBride was overweight for most of his life. He started dieting during his teenage years, in a desperate attempt to fit in, and this continued into his adulthood as he tried all the different diets out there. He would lose a couple of pounds initially, and then gain even more weight back. When he decided to take matters into his own hands he lost more than 250 pounds in less than a year and has managed to keep it off for more than ten years. His approach was simple: eating less, exercising more and working on improving his self-esteem. In his book, Just Stop Eating So Much!, he shares the method he used to lose weight quickly and effectively and outlines a simple plan that anyone can follow. McBride says that losing weight really is simple: Just stop eating so much! His meal plan is easy. Each day you choose one breakfast, lunch and dinner from the menu options provided. This way you create your own meal plan based on your personal preferences. Breakfast is considered essential and consists of fresh fruit combined with a grain such as oatmeal, brown rice or whole-wheat toast. Lunch and dinners predominantly are based on lean proteins with salad, vegetables and fruit. On the days that you are really hungry you can choose one to two snacks daily from the selections provided. Dieters that have less than twenty pounds to lose also are given “splurge” options that may include a glass of red wine, a piece of dark chocolate or a handful of raw cashews. Additionally you should consume 8-10 glasses of water every day. You are encouraged to keep a food diary and track your weight loss results because this maintains awareness and motivation. If you are tempted to cheat you are reminded to keep a positive attitude, perform a stress-relieving breathing exercise or watch TV to distract yourself. Whole wheat bread, brown rice, puffed wheat cereal, oatmeal, grapefruit, oranges, banana, cantaloupe, strawberries, tomatoes, spinach, Brussels sprouts, cucumber, carrot, celery, cottage cheese, eggs, chicken breast, tuna, swordfish, salmon, lean beef, raw cashews, red wine, dark chocolate, black coffee, green tea. Dieters are encouraged to exercise for at least 30 minutes, four to five times a week. If you are not very physically active you can gradually increase your activity level by ten minutes each week. A combination of walking, resistance training and yoga is recommended. The book also includes instructions for a series of eight exercises that are appropriate for most fitness levels. Just Stop Eating So Much! retails at $19.95. Encourages the consumption of whole foods such as grains, fruits, vegetables and lean proteins. Eliminates unhealthy foods such as those high in fat, sugar and salt. Encourages the consumption of breakfast, which has been associated with a greater chance of achieving weight loss. Skipping meals is discouraged, which generally results in a reduced intake of calories at the end of the day. Encourages a balanced exercise routine. Acknowledges the importance of stress management for successful weight loss. Includes tips on planning meals for families. Meal plan may quickly become boring due to lack of variety. The fruit and grain breakfast may not be adequate to maintain energy until lunch for many dieters. Some healthy foods are eliminated such as legumes, nuts and avocado. Encourages the consumption of high-mercury fish such as tuna and swordfish. Meal plan is lacking in essential fats. Just Stop Eating So Much! 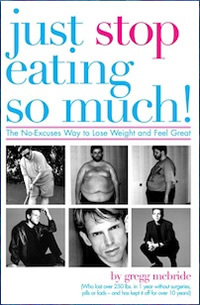 is a weight loss memoir combined with a simple low-calorie, low-fat diet plan. Most dieters will experience fairly rapid weight loss with this program, however, rebound weight gain is likely if dieters can’t incorporate this type of diet and exercise as a long-term lifestyle.